SafeNeedleDisposal.org provides safe medical sharps disposal information based on zip code. The site is run by NeedyMeds, a national non-profit patient education organization. Years ago our local pharmacy had a sharps recycling program. They gave you the container, and you returned it when it was full. I was saddened when they ended the program because I try to do my due diligence when it comes to the mounds of diabetes trash we generate, especially syringes, which can accidentally hurt someone if not disposed of properly. We collect our used syringes (sharps) in an empty detergent bottle. When it’s about 3/4 of the way full, we cap it and tape the cap. I write “SHARPS” all over it with Sharpie. And then we put it in our normal curbside garbage. While this is one of the ways that you can properly dispose of sharps, I was happy to see that when I entered our zip code into the search box on the SafeNeedleDisposal.org website that there were three different locations nearby that receive sharps. Most consumers already have everything they need at home to dispose of sharps safely. First, used sharps must be placed in a strong plastic container before it is discarded. The container — which can be an empty laundry detergent or bleach bottle — should be leak-resistant, remain upright during use, and have a tight-fitting, puncture-resistant lid. 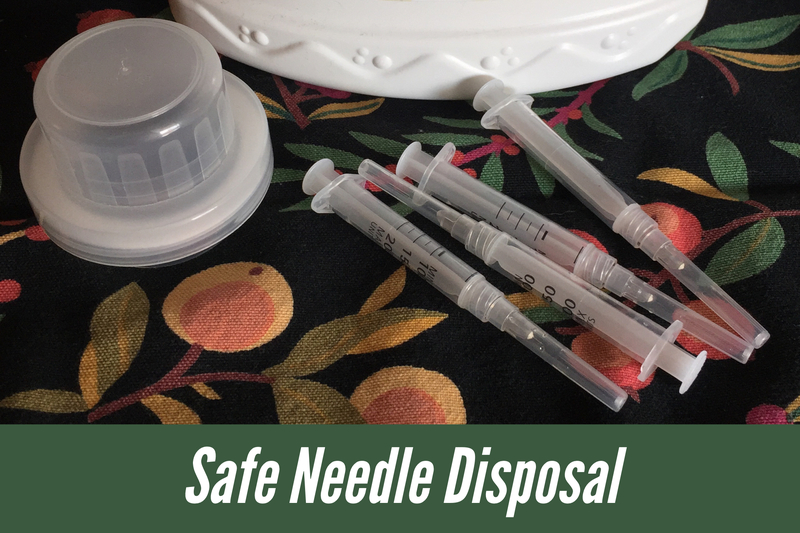 When the container is about 3/4 full, individuals should follow guidelines for proper disposal at SafeNeedleDisposal.org — some cities allow in-home trash disposal others require used sharps to be taken to drop-off locations. According to the U.S. Food and Drug Administration, sharps that are not disposed of properly may cause injury. To minimize risk and increase awareness about recommended disposal practices, SafeNeedleDisposal.org encourages visitors to click on their state or enter their ZIP code to learn about local disposal regulations and options. How do you deal with the mounds of waste that diabetes produces, particularly the used syringes? Let me know in the comments.